I find showing my development of a piece of a work quite hard as it is not shown in set stages and is constantly changing. Therefore I am going to show one scene that has changed in different stages so you can get an idea of how I work. 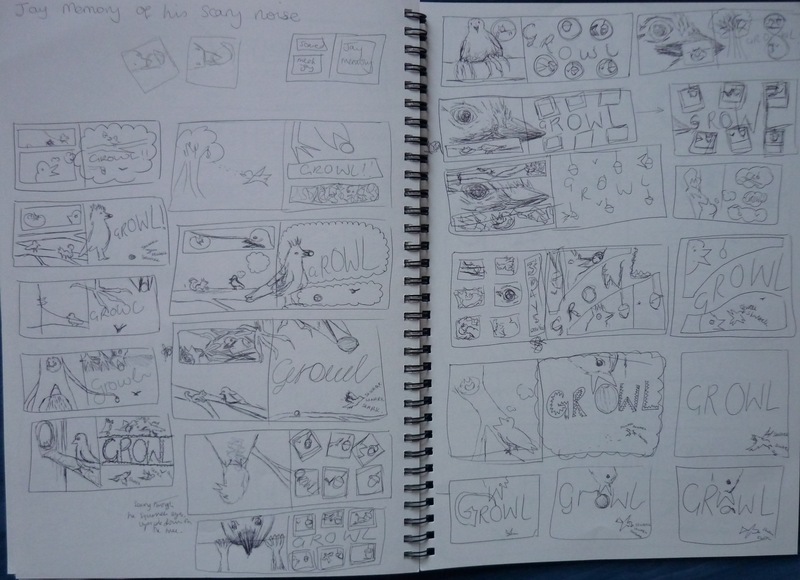 So the images above and below are many sketches of the scene where the Jay is remembering when he heard a strange scary noise whilst trying to eat some acorns. I like generating different sketches as I can pick and choose which works best and then merging them together to create a rough final image. 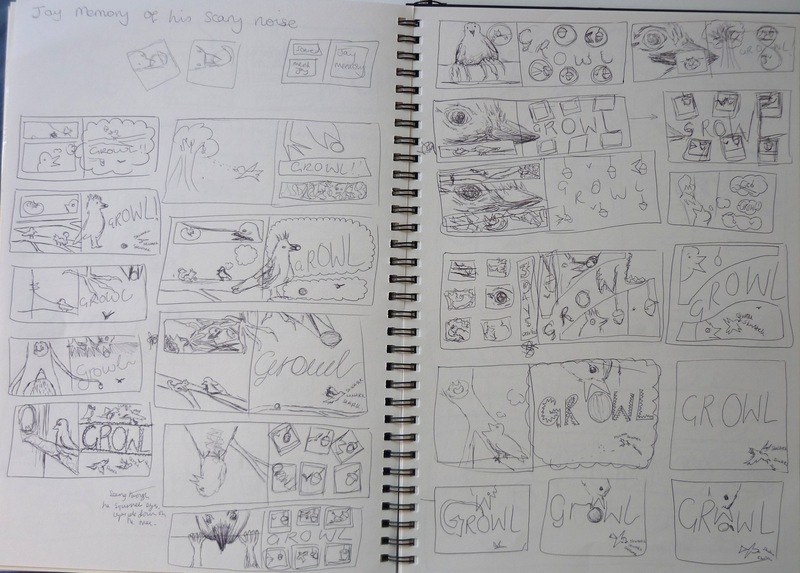 After much deliberation I chose the following layout as I felt it emphasised the sound well whist keeping the flow of the story. 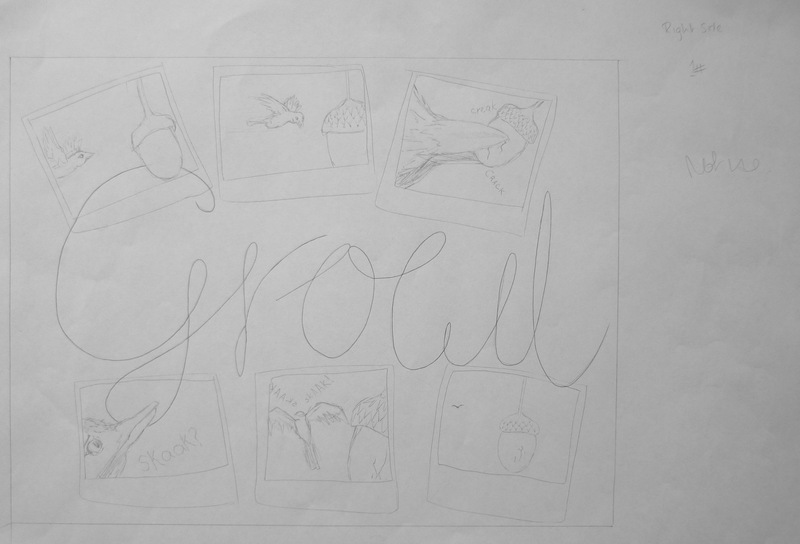 Above was the first main drawing and as you can see the text is large in the centre of the page and there are small thumbnail photos of the story unfolding. I picked photos as this tends to be a tool that we use to look at to remember moments in time and as the Jay is remembering a moment in his life I thought it goes hand in hand. 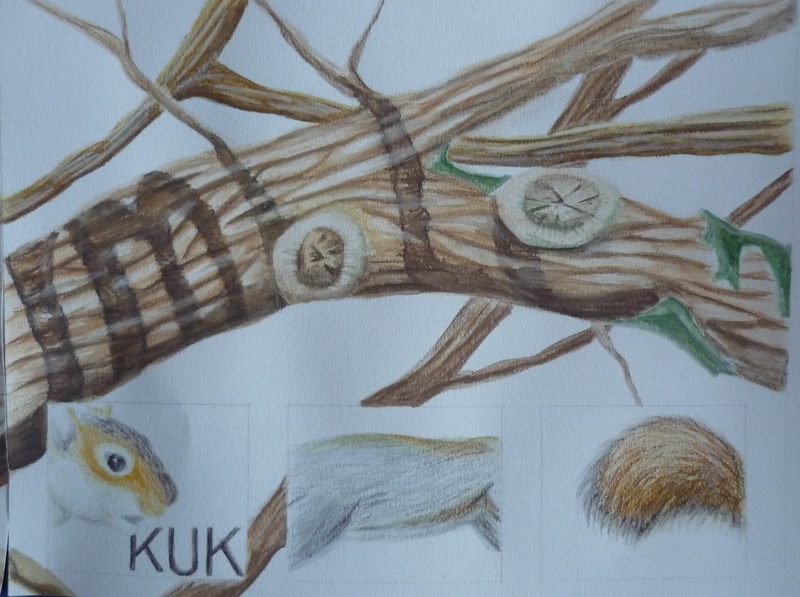 I drew the Jay so it was flying towards the acorn and was increasing in size and then reversing the motion when it had been scared by the noise creating a full circle. I also highlighted it in black fine line as I thought this would be best to show the image but it didn’t and made it feel clumsy. The text is bold cap locks with spikes to show the power and rumble of the noise. 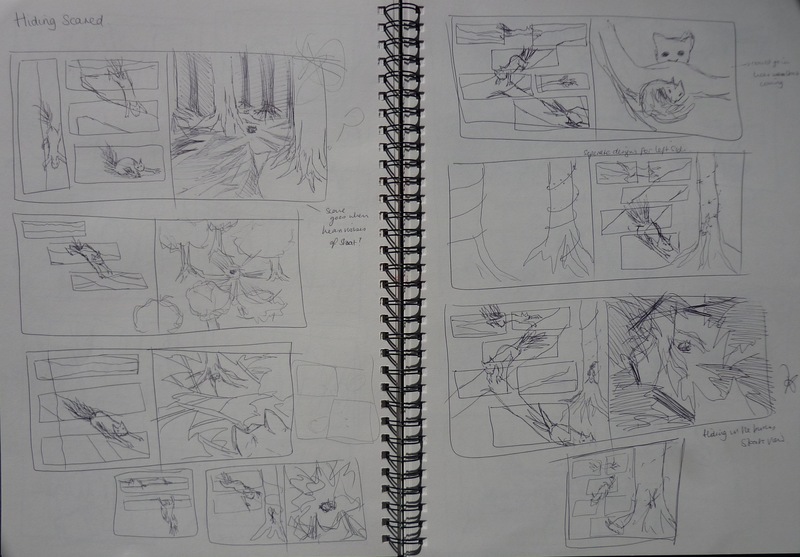 It is very straight and as this was the early stages of development I was soon told that I needed movement in my scenes which I capture in my thumbnails but not in my larger drawings. 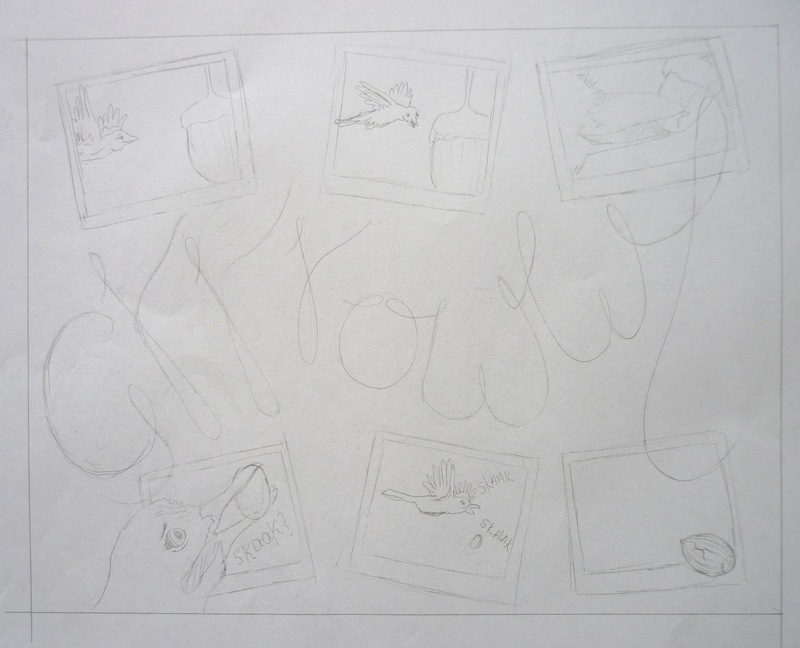 I felt that the first drawing could be improved by changing what was inside the photos and the way the noise was drawn. I felt the bird flying towards the viewer was hard to draw and looked funny and so I changed it to a side profile. 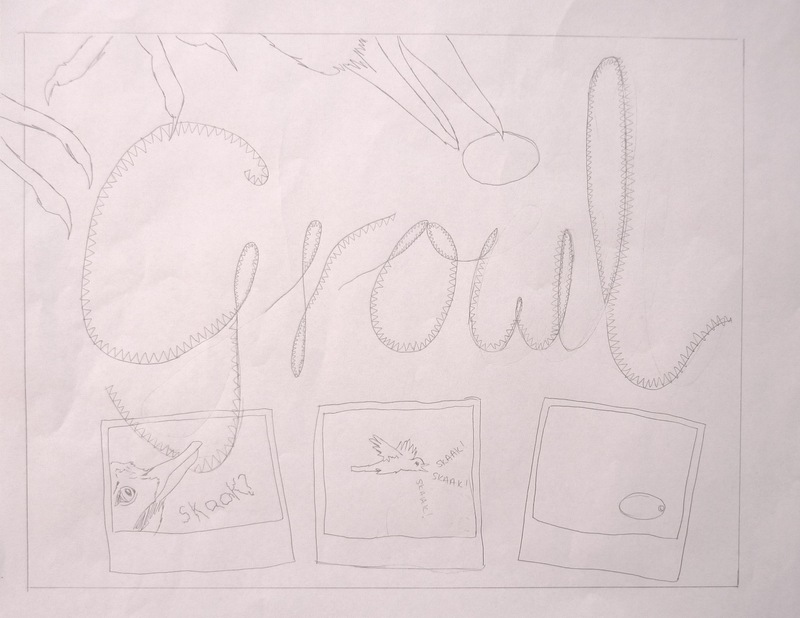 The growl was re-drawn as the previous image was too blocky and I wanted it to flow. I kept saying the word out loud over and over and allowed my hand to flow with the noise. 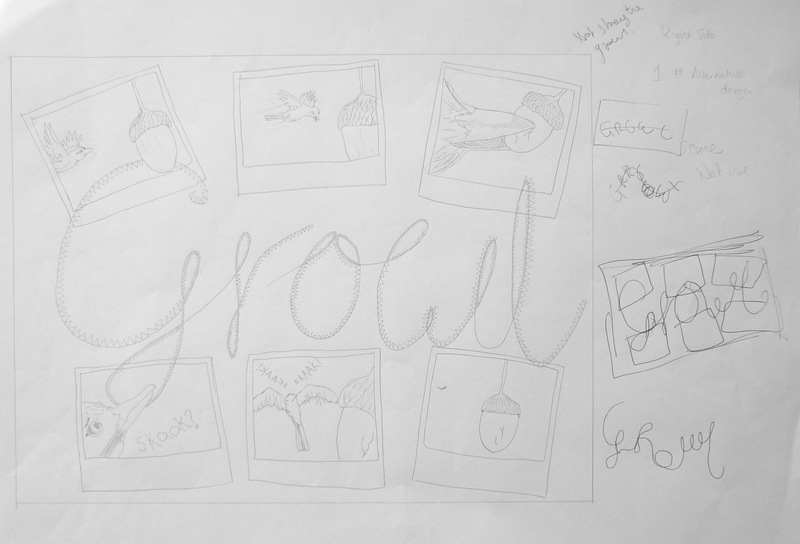 After having a crit, it was decided that the growl noise was better than the previous design but still wasn’t scary enough and was too smooth. 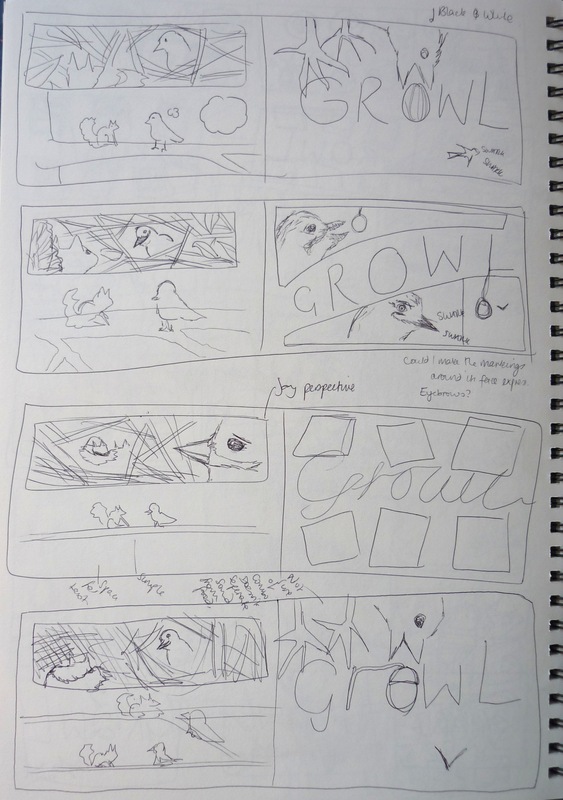 Also, it seemed to be set in a set grid and didn’t have much movement as previously mentioned in other blogs. 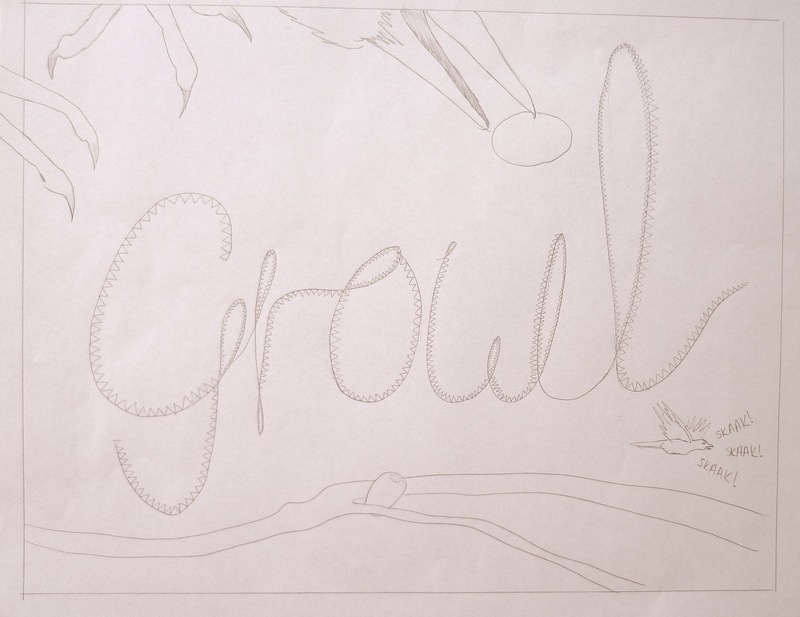 This was the next developing scene, the growl now has spikes (as previously drawn on original idea) on the letters which gives a more menacing look whilst still keeping the flow of the sound. 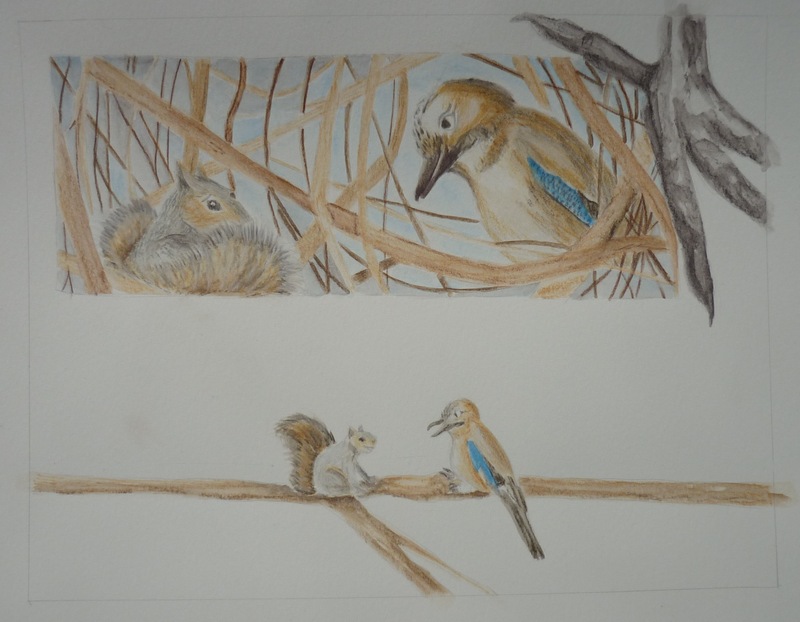 I erased the top three images and replaced it with the foot and beak of the Jay picking up the acorn (overlapping onto the previous page linking the flow of the pages) as at the time I thought this illustrated the motion of him picking up food and then hearing the noise to which he flies off scared. However, after having another crit it was felt that the image didn’t communicate efficiently enough and I had to explain what was happening in the images. 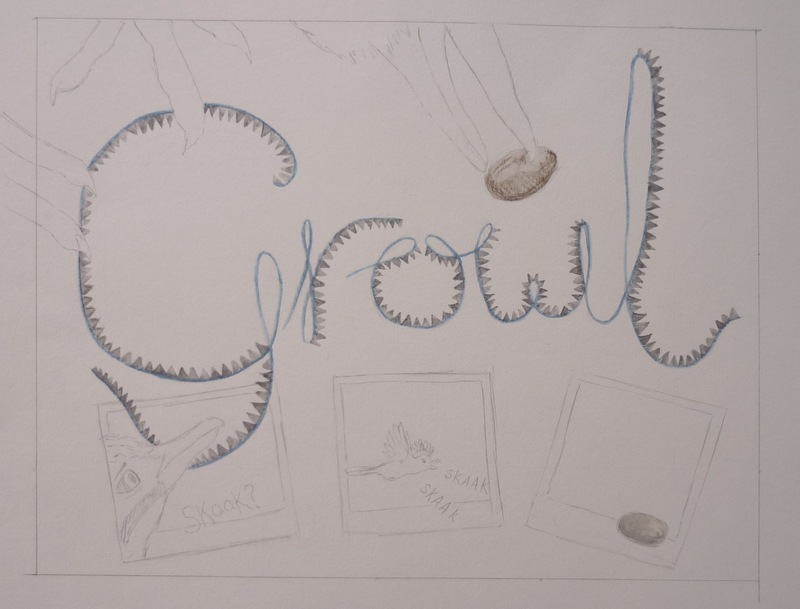 The image was being read as the Jay is looking up at the giant feet which was hard to work out and the text was too straight and had no motion. So I changed the bottom of the image to him flying away with the nut lying in-between two branches as the Jay had dropped it. 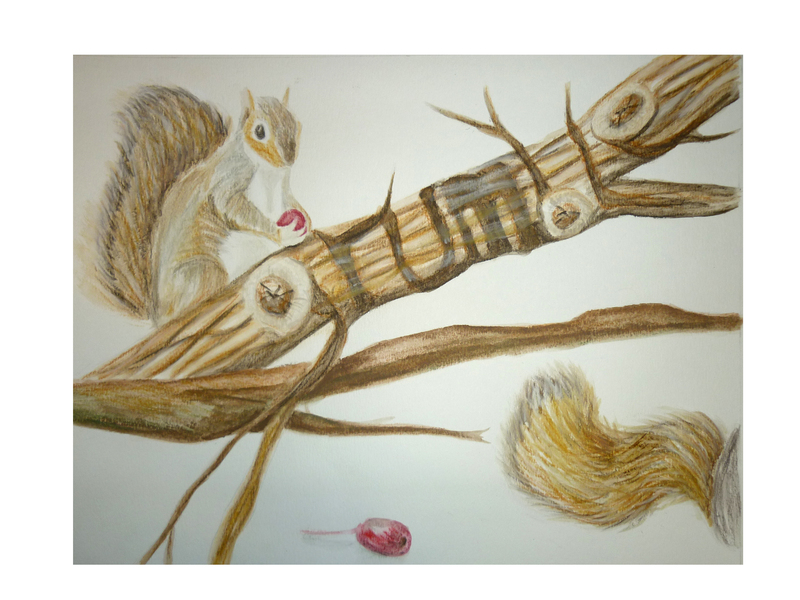 I made it incredibly simple (as this was a suggestion in a previous concept panel) with the Jay picking up the nut at the top, it hears the sound and then the bottom image is him flying away scared. 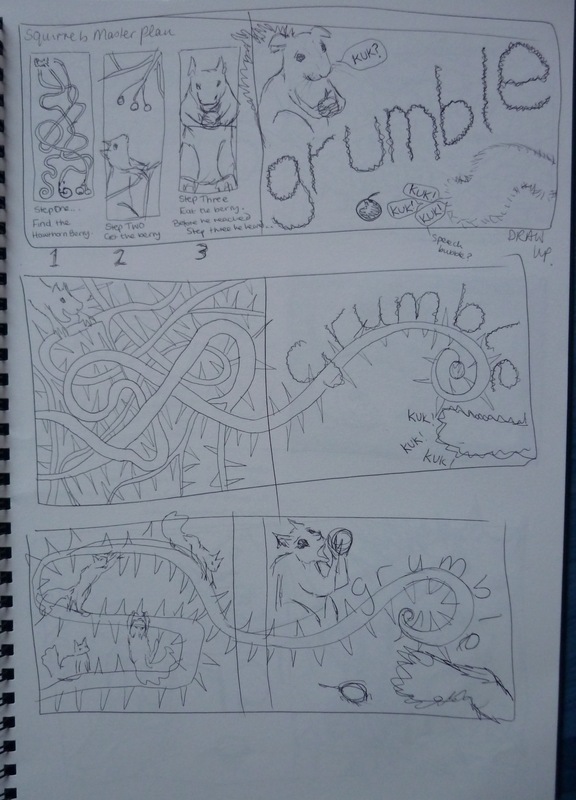 However, after another crit it was decided this was too simple and didn’t create enough excitement. Also, the birds feet was still hard to decipher and so I decided to take it out completely. So I went back to the second original design which I thought I wasn’t going to do at the beginning. I placed the photos more tilted so it didn’t look gridlocked and added the spikes to the text as this worked. 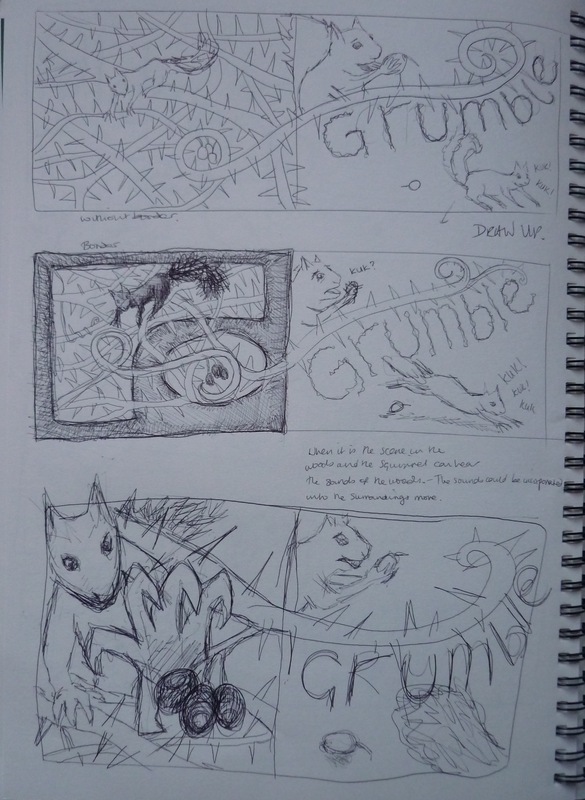 However, after another crit it was decided that the text was still too straight and needed to be emphasised to create a more atmospheric and flowing scene. Also the images could be slightly smaller to allow the noise to intertwine with the images. Before I changed the scene I had already painted a previous design and I wanted to experiment with the colours. I chose to incorporate blue within the text to interlink with the dash of blue on the Jays wing with the noise. The spikes were grey which shows danger and has a sharp edge to the sound. I reversed the colours so the spikes were blue but it did not look right and so I chose this colour scheme. This is the final design of this particular page. I have changed the shape of the noise by curving them along the page and added letters to the word to emphasis the sounds within it. Keeping the flow of the type allows the word to role of your tongue and I will be drawing the spikes back onto the letters to still give it a menacing look. The photos are still slightly angled and are smaller allowing the noise to breath. The images within the photos sometimes break the boundary to create interest and avoid sticking to rigid guidelines. I think this looks a lot better than the first image and so I am happy to start adding colour. I have not done this yet as I am still working on the other scenes, as I want to finish the all scenes and lay them out making sure they flow. After that stage is complete I will incorporate colour. So as you can see there are constant little tweaks as well as large ones and this blog would never end if I explained everything but when you reach the “end” (designing a scene never ends just constantly tweaking) I find it is good to look at your original design to see how far you have gone and achieved. Also there might be something on the original design that you missed that could complete or improve the final image. 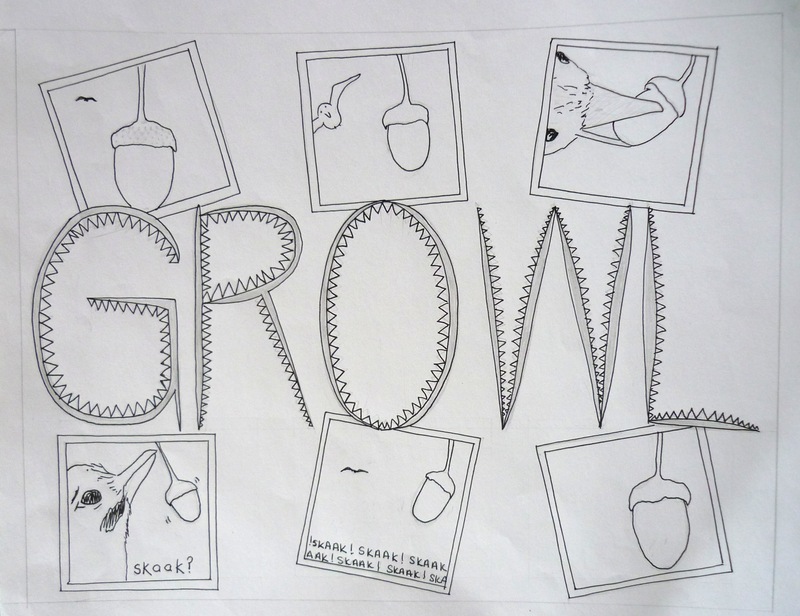 This entry was posted in Showing development. 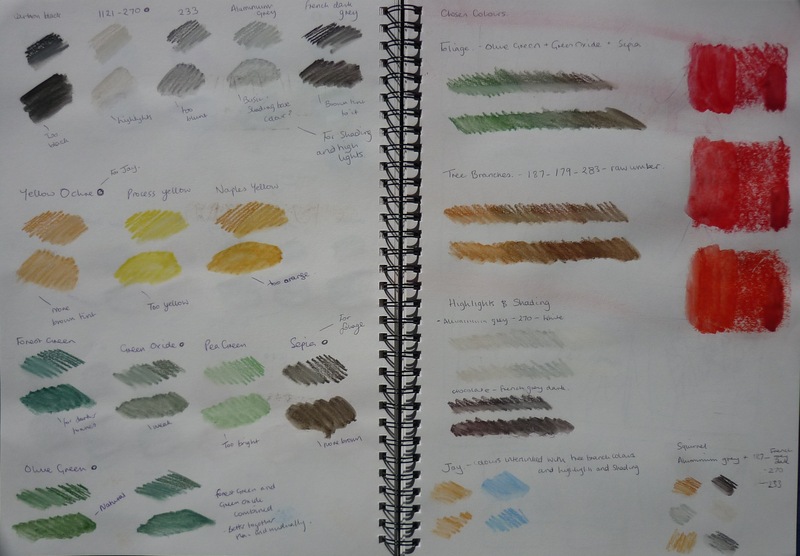 Before I started to create some images I thought it would be wise to create a colour palette and so I don’t go over bored with the colour system. I was initially going to select three or four colours but then I decided to separate the colours into sections as there are so many layers. I tried to pick colours that are natural and close to the colours of the forest. I avoided black as this is too harsh and as I am not using any black outlines would stand out too much and so I have gone for dark greys and browns. I had never done a colour palette before but it definitely helped as it focused my style even more. The original drawing was slightly too big and the drawings weren’t as clear and so I was experimenting with making the single page smaller and trying to fit the double page spread on one sheet of paper. The colours are working as they are very similar tones and some colours I will put throughout the book like the Jays flash of blue and so the book flows. I found trying to fit the whole scene on one page difficult as the drawings were hard to include detail as the tip of the pencil was too large and so looked clumsy. Reducing the size of the page on a single spread allows it to be big enough to add detail but not too big to be clumsy. I am sticking with a slightly elongated square as I find the sound can fill the page and be the centre of the page. Although the first image is the style I want to achieve throughout the book, I feel like some of the images are not working and do not help to tell the story. This entry was posted in Size of the pages. After the concept panel I have been working hard on images and developing movement in my scenes. 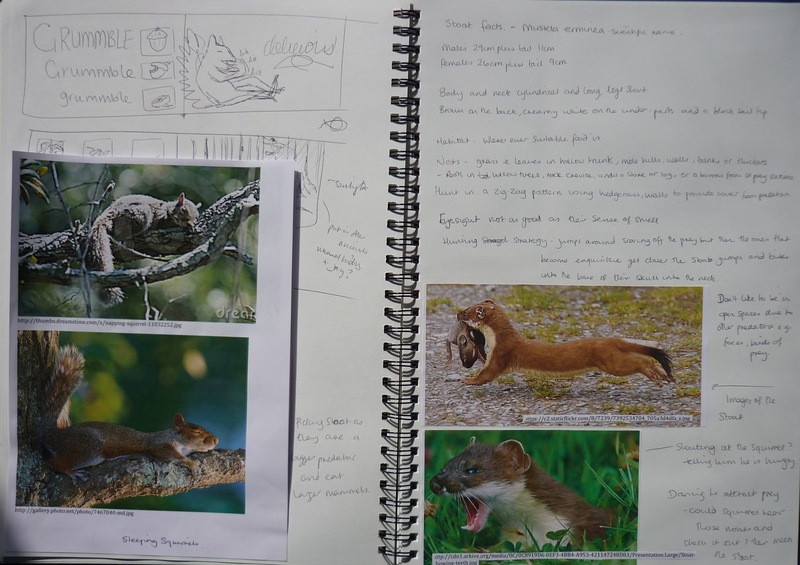 Even though I know I have been working non-stop I feel like I haven’t got a lot to show for it but I know that I have sorted out a lot of technical things like the size of my book. 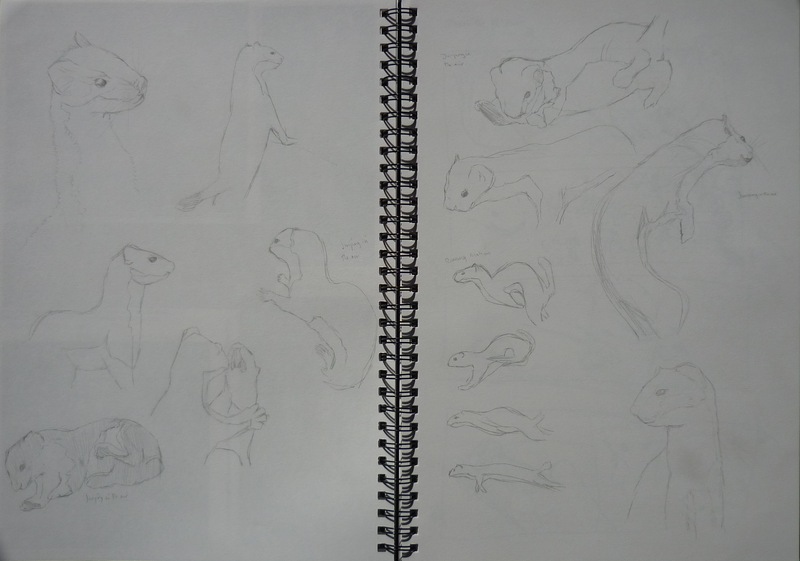 I wanted to start developing the other main characters within the book and one of them was the stoat (not a weasel, as stoats are bigger and I wanted it to be menacing). 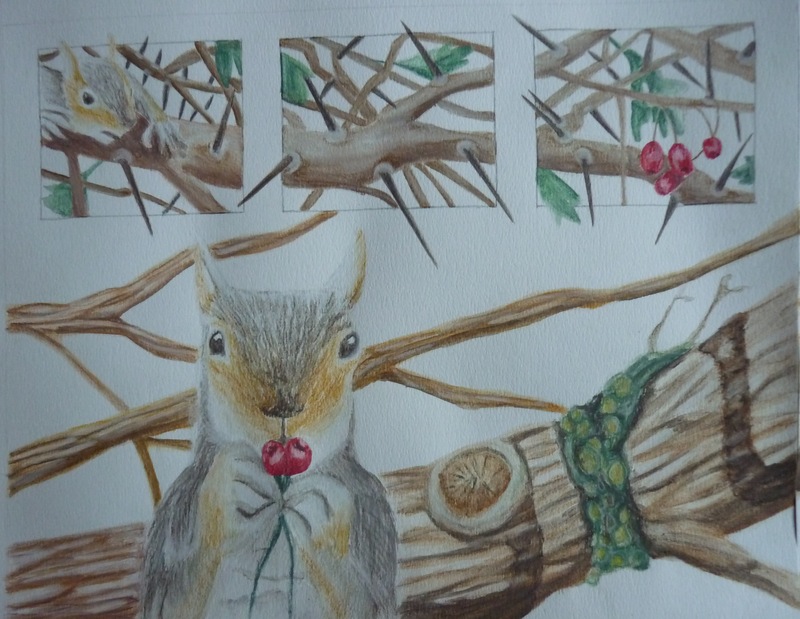 Similar to the squirrel I watched videos to draw from as I found this creates more movement compared to purely photos. Looking at them now I know I will probably use some of the within my book. I didn’t colour any of them in as I feel the colours would change depending on what scene or lighting the surroundings would be. This entry was posted in Catch Up… since the concept panel..